Prompt: Find something that happened on the day and date you were born. Write about it. Seven seventeen, a date with duplicate numbers. My birth date. The middle of summer. Vacation time. But much more. Two events took place on July 17th that leave me wondering, do we become the date we were born? One hundred fifty days after the rain started, on July 17th, the waters abated and Noah’s ark rested atop the mountains of Ararat. My grandmother was the first to point it out to me. She read from the Bible, Genesis 8:4: “And the ark rested in the seventh month, on the seventeenth day of the month, upon the mountains of Ararat.” Unbelievable to me as a child. Then she said I was blessed and I believed her. Again, on July 17th, a world changing event took place. 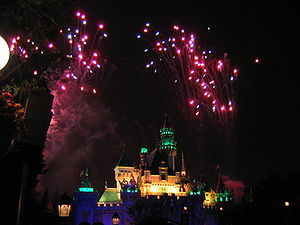 Disneyland opened in Anaheim, California. Physically, I have been to Disneyland once in my life, and it didn’t disappoint. Through the Disney movies, animated characters and fairytales, I’ve traveled to that fantasyland often in my imagination. There’s something fun-loving, optimistic and very hopeful about “wishing upon a star” and believing that “dreams can come true.” As an adult, I still love animated movies due to Disney. I wonder if Noah viewed seven seventeen as a blessed day or a day when his dreams came true? Centuries later, did Walt Disney believe seven seventeen was a blessed day when he made his dreams come true? I’ll never know the answer. I do know this. I love the numbers seven seventeen. I love my birth date. Each day that passes, I become more like the day I was born–blessed and filled with achievable dreams. This entry was posted in #Trust30, Life, Thoughts by Flo McAfee. Bookmark the permalink. Hmmm….definitely something to think about. Love this line – “Each day that passes, I become more like the day I was born–blessed and filled with achievable dreams.” For me groweth is like the fountain of youth. The more of my authentic Self is revealed, the younger I feel! I feel the same. Thanks. Seven seventeen, the day you came into this world, is indeed a sacred day! And that is worth celebrating.